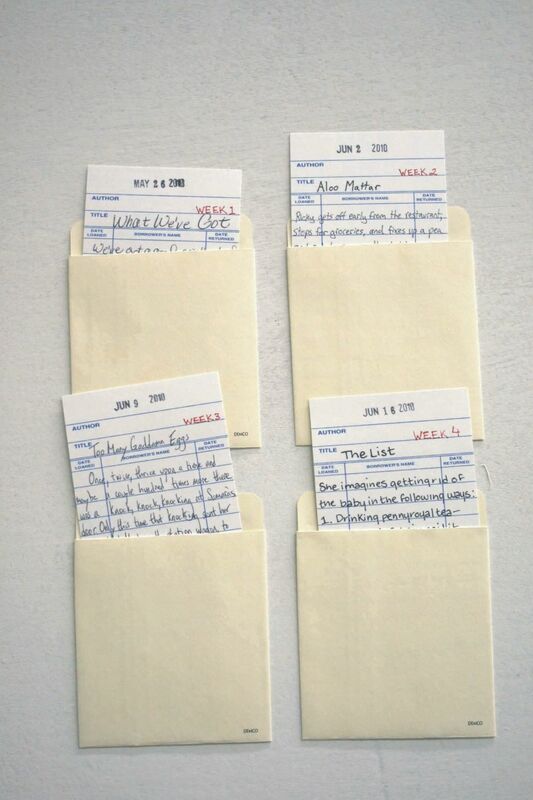 "Due Date" is a series of 36 microfictions that follow a woman through the term of most of her pregnancy. Each microfiction is written in a different style and tone. The microfictions were then handwritten by 36 different women onto library due date cards, which were then installed on a gallery wall in a 6 x 6 grid to invite the viewer to read the pieces in a non-linear order. The work premiered at the Stewart Gallery in Grinnell, Iowa in 2011. In 2015 was part of the show "Use Your Words" at the Woolen Mill Gallery in Reedsburg, Wisconsin. It is published in zine form (available for sale on etsy) and in the literary magazine Driftwood Vol. 2 (2014) and was nominated for a 2015 Pushcart Prize.